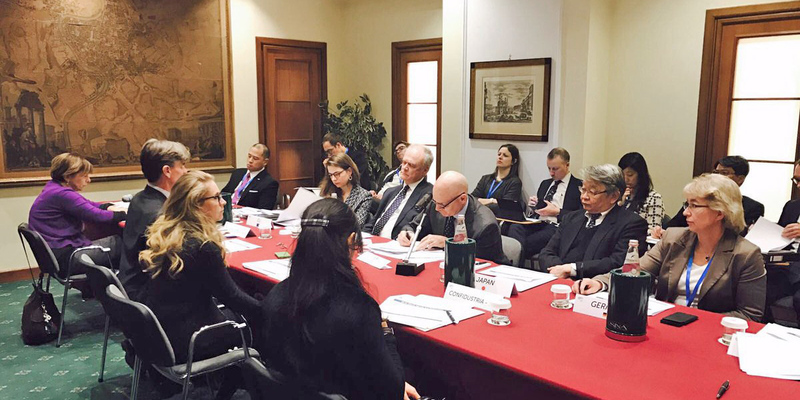 Global trade governance, innovation, sustainability and the efficient use of resources: these are the main themes on the B7 agenda, as indicated at the January 27 meeting between representatives from the business community and the G7 Sherpas. The objective of this meeting was to illustrate the B7 priorities for the upcoming March 30-31 event, to be supervised and coordinated by Confindustria. Each year, alongside the Summit of the Heads of State and of Government, the Business organizations of G7 Countries hold a “Business Summit”, with a rotating presidency that corresponds to the G7 one. Held for the first time under the German Presidency, in Berlin in 2007, the B7 offers the opportunity to business leaders from all the G7 countries to meet and formulate concrete proposals and policy recommendations. Through a joint declaration, they convey to the G7 Presidency the recommendations of the business sector. The priorities of the B7 Italy are clustered in two panels. The first will be dedicated to “Global Trade Governance" - which includes various subcategories such as market access, non-tarriff barriers, market distortions, unrestricted competition and WTO reform - and the second will deal with “Innovation and Sustainability”. As part of this latter topic, the B7 will address: Industry 4.0, R&D policies, energy efficiency and circular economy. Furthermore, on March 30, an International Workshop will precede the B7 gathering, and will be open to the public. This meeting, with the aim of contributing to the definition of coherent policies for sustainable development, will focus on resource efficiency, and will be organized by Confindustria together with the Global Business Coalition. The conference will mainly deal with resource efficiency, to be meant as smart management of both materials, energy sources and natural resources. As highlighted by Confindustria, this topic has been chosen due to its several industrial policy implications, as well as for the horizontal impacts on energy, environment, transports, infrastructures, innovation and research.